Alkaline granulates for enzymatic cleaning in soaking baths, ultrasonic devices and thermal washers. Remove blood and protein from rotating precision instruments and endoscopes. 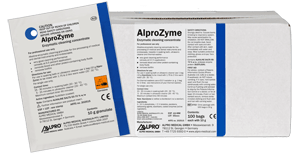 For use in soaking bath or ultrasonic cleaner 1 bag (10 g AlproZyme) to be mixed with 1.75 to 2 litres warm water (20 – 30°C). For thermal washers use a 0.5 % solution (e. g. 1 bag for 2 litres – see instructions of your thermal washer). Phosphates, tensides, parabenes, defoaming agents, stabilizers, coated enzymes.